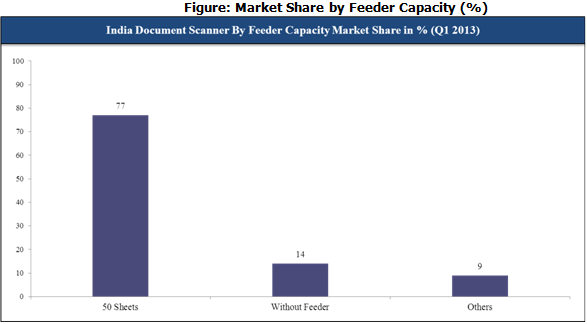 India Document Scanner market registered a Total Unit Shipment of 20,342 units in CY Q1 2013. Hewlett Packard emerged as the market leader followed by Canon and Plustek. According to 6Wresearch, the India Document Scanner market registered a Total Unit Shipment of 20,342 units in CY Q1 2013. Hewlett Packard emerged as the market leader followed by Canon and Plustek. 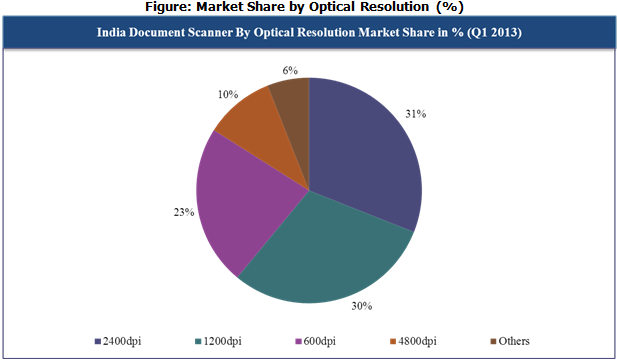 The Indian Document Scanner market is dominated by 2400 and 1200dpi (Dots Per Inch) optical resolution scanners. Further, 2400dpi leads the Indian market having 31% of the market share followed 1200dpi with a share of 30%. More than 14 vendors shipped document scanners. Hewlett Packard, Canon and Plustek together constitute 83% of the total market share. More than 90% have RGB (LED) light source. Duplex document scanners have more than 51% of the total market share. More than 85% have ADF (Auto Document Feeder) feature. The unit shipments of document scanners having ADF feature of 50 sheets accounts for 77% of the market share. Further, CMOS (Complementary Metal Oxide Semiconductor) image sensor leads the CY Q1 2013 India document scanner market having more than 65% of the market share followed by CCD (Charge-Coupled Device) and CIS (Contact Image Sensor).